Does the thought of writing a business plan make you wince? You’ve been struggling valiantly through most of the non-writing, left-brained activities that have been thrust upon you as a modern writer–do you really need to go through the formality of crafting your “executive summary”, “sales forecasts” and “market analysis”? But if you’d prefer to skip the spreadsheets in favour of a more “writer-friendly” planning process–because deep down you know you could use a bit more direction to move your writing career to the next level–you’re in luck! I’ve designed this business plan framework with the creative entrepreneur in mind. Yep, it’s still a business plan. But I’ve tried to soften the corporate jargon, as well as give you ideas as to how you can use each section to grow your writing career. It’s time to overcome your resistance to the idea that, as an author, your job is no longer just to write (if it ever was). If you want to turn your passion for writing into a business, you’ll need to have a solid and strategic plan in place. And a business plan is simply a guide to what you hope to accomplish, how you plan to meet those objectives, and your financial projections based on these efforts. It’s a field guide to your writing business – that you navigate with your readers in mind. One of the most important (and often ignored) steps to effective goal setting and increased productivity, is to write your goals down and review them daily. This can be a game changer. By dedicating the time to write your business plan–and review it frequently–you can change the trajectory of your writing career. 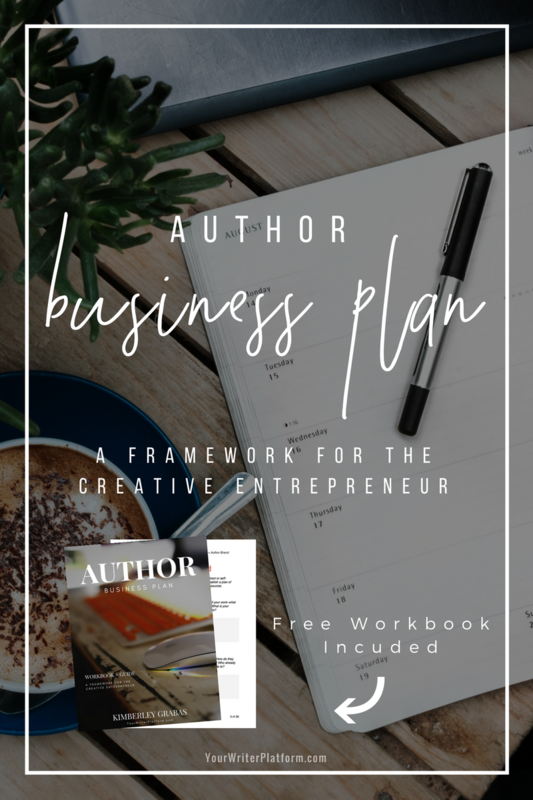 Whether you are working toward a traditional publishing contract or self-publishing, a carefully crafted business plan will help you establish a plan of action, and guide how you will allocate your (often limited) resources. Identify and define the group of people whom you wish to reach. How do they see themselves, and how does your work fit with that perception? Who already ‘speaks your language’ or conversely, whom does your work speak to? We’ll be digging deeper into this in a later section of the business plan, so the information you gather will help to create a succinct description of your ideal reader here. What is your brand story and personality? What do you want people to feel or experience when they read your book, a post on your blog, or see you speak at an event? What tone, colours and visuals characterize your writing, and how does your branding reflect the purpose or message behind your work? What values, standards or best practices will you adhere to? What can your community of readers consistently expect from you in terms of your style, authenticity, voice and professionalism? Make sure that your branding is relevant to the audience you seek, distinct and meaningful. Many people do not even think of goals, and of those that do, very few right them down. Forbes reports a remarkable 10 year study about goal-setting carried out in the Harvard MBA Program. Those students who wrote down their goals accomplished significantly more (i.e., earned on average, 10 times as much as the other 97 percent of the class combined). So write down your goals and objectives. Make sure they’re both S.M.A.R.T and what you really want. Are you willing–and able–to sacrifice the time and effort required to achieve what you’ve outlined? How will you determine your success? This is your secret sauce or unfair advantage. Describe who you are as a writer, and how you will portray that uniqueness to your audience. How do you solve their problem or desire and why is it valuable to your readers? The goal here is to answer the question in your reader’s mind, “Why you?”. What sets your work apart from others in your genre or niche? Develop your “brand story”. Describe your target audience (demographics, psychographics), and how you can help meet the needs, wants and desires of that specific group. Often writers make the mistake of working on their projects in a vacuum–with no feedback, input or even acknowledgment of the reader. Another conundrum authors face, is writing in multiple genres, which makes building a community even more challenging. Note if either (or both) of these are concerns you face, and how you will address them going forward. In this part of your business plan, include your writing, editing and publishing schedule. How many words per day will you write, and at what times? If editing, how many hours per week will you devote? How many books do you plan to publish (and launch) this year? How often will you post new content to your blog or social media. Also note your genre focus, project lengths and additional projects (workshops, courses, presentations, etc.) you plan to produce per year. What is your writing business structure (sole proprietor, publishing company or LLC, for example)? Are you traditionally published, self-published, a hybrid author or not yet published? Describe the components to your business, like books (digital, print, audio), courses, seminars, workshops (in-person/virtual), speaking, and so on. Is your business primarily online or offline? It’s important that you treat your writing business as a business. So make a list of regular tasks (everything from sales tracking and accounting, to editorial calendars and words written per day), and add them to your calendar, Asana, your day planner or whatever system works for you. You’ve defined your audience, so now you need to determine how they want to be reached. Where are they already and what are other ways that they will find you? Think social media, email, traditional media, video, podcasts, conferences and events, website, clubs, Amazon and other retailers, and so on. What pricing model(s) are currently being used in your genre or niche? What are readers used to paying for books, products or services similar to yours? Choose 3-5 authors from the list you made in section C. 1., and break down their strengths and weaknesses. How do they reach and promote to their audience? Are there any strategies that many of your competitors seem to use (for example, are most of them using email marketing strategies)? What are they doing well and what can they improve. What can you add to the mix that draws upon your unique skill set and brand? Use this knowledge to craft your own, well-rounded strategy. Note current events and what’s new and noteworthy in the publishing world. Note predictions and future trends that may impact your writing or bottom line. Are there any collaboration or partnership opportunities that you wish to pursue, both within your topic area and with industries or businesses that reach the same audience as you? Given what you now know about your target audience, what is the intersection between your unique talents and your readers’ needs or desires? What can they get from you and your work that they can’t get anywhere else? It is much, much easier to create interesting, relevant and valuable content for your audience now that you know exactly what they are searching for. You can’t possibly develop a marketing and book promotion plan when you have no idea who might be most receptive to your message. How will you learn (and continue to learn) about your readers, but still stay connected to the reasons for creating the work that you do? What are your (and your readers’) preferred platforms? Where will you place your emphasis and what strategies will you use to develop visibility and interest for your writing? What will you share, how will you create it, when will you share it, and where will you share it, to get the most engagement? (Create a specific plan for each social media platform you’ll engage on). Developing a responsive email list is one of the most important things you can do to grow your business and stay connected with your readers. What strategies will you implement to grow your list? How often will you communicate with your subscribers, what will you share and what opt-in incentive will you develop to encourage sign ups? A content strategy is your publishing plan of action for what to create, how to create it, when to create it, and for whom to create it. Develop an editorial or content calendar to map out and keep track of your content plan o’ action. Ensure your “brand story” is woven into the content you share. Keynote speeches, personal appearances and other speaking opportunities all allow you to connect with your readers and fans in real life. Add presentations, interviews and other appearances you have booked (or plan to book) into your business plan. What strategies will you implement to increase bookings? What steps will you take to encourage reviews (ARC’s, email request, build relationships with influencers and book bloggers)? How will you gather testimonials and endorsements for your work? Keep in mind that relationships take time to develop, so ensure you include steps to build these connections and goodwill before you ask for something in return. How will you ensure your readers feel special? Will you offer special perks, bonuses and a sneak peek behind the scenes? Or, create a street team or other type of “membership” for your most avid supporters? How is what you have to offer different from other authors in your niche, and how can you add more value? Who are people talking about, sharing content from, and influenced by? What strategies will you use to develop relationships with industry influencers, advocates and supporters of your work? How do you plan to build connections with organizations, institutions, schools, bloggers, reviewers, businesses and media outlets? What will you offer to your audience? Books (digital, audio, print, series, bundles), services (speaking engagements, teaching at conferences, and hosting workshops) courses, freelance work, or other products and programs that relate to your work? How will your readers benefit? How will it impact their lives? Given what you’ve discovered about your target audience, will they want, need or desire what you have to offer? What pricing strategy will you employ? Premium, freemium (free + premium), permafree or discount pricing? Given your goals for your business, will your pricing strategy help you meet your objectives? Does your pricing meet or challenge genre standards? How will your target audience view your pricing? Map out your pricing structure for your books, services, courses or workshops, series, and bundles. Affiliate marketing, book bundles, co-writing and cross promotion (via email lists) are all great ways to boost your business, visibility and sales. What methods will you use to develop partnerships and encourage collaborations with other authors? In this section, outline the methods you’ll employ to market and promote your books, products, content and brand. You’ll want to develop a separate book marketing strategy for each book, as well as an overall strategy that ties current projects together with future plans for your writing career. Finding time to write is difficult enough, but your business won’t run itself. You need to schedule time and resources for both the writing side of your business and the marketing side (and then squeeze in family and personal commitments, too 😉 ). How much time, money and other resources are you prepared to realistically commit? Related Content: The Big Question: How Can I Build My Platform and Still Have Time to Write? Designing, organizing and implementing a book launch action plan is not easy. There are a lot of moving parts, so it requires the careful preparation (and execution) of just the right mix of launch activities to propel your new book out into the world. Layered launch strategies (where you use the momentum from one launch to boost the next) can create urgency and excitement, and further establish your brand, message and authority. What actions will you take to leverage the assets and relationships you’ve established through your marketing activities to promote an upcoming book? Make an itemized list of all the things you will need for your business to run monthly (website, hosting and domain name, email marketing service, business cards and other promotional items, office supplies, membership dues, etc.). If you are saving for some larger future expense (computer, software, cover design), then note this in your budget, as well. Copyediting, line editing, proofreading, formatting for publishing, formatting for print, cover art, copyright registration, ISBN’s, review copies, shipping and research costs can all be budgeted on a per book basis. These input costs will help you determine the potential viability (and profitability) of each project. If you also have a website and blog, there may also be production costs for blog posts, email newsletters and other items (image or graphic fees, costs for giveaways, apps or software, etc.). Your talent is your best asset. Continuing to improve upon both your writing AND your business skills, is a wise investment. Use this section of your business plan to note any classes, workshops or conferences you plan to attend, if you plan to find a critique partner or writer’s group to join, or even add specific books you plan to read (for genre or topic research, or to gain additional skills). Paid advertising, hiring a publicist or anything else that requires cold hard cash upfront–without a guarantee of return–may not be on the top of your priority list. However, if you are considering some paid options, ensure you note your strategies here. Tracking your return on investment may be easier for some options than others, but it’s always wise to note your efforts and results. Continuously developing new content can take a lot of effort. Get more mileage out of the excellent content you produce (articles, newsletters, blog content, short stories, guides, updates, videos, etc.) by repurposing it into something fresh. You can change the format, share it on different mediums, turn a book or post into a course or workshop, and reach all new audiences. How will you stretch and repurpose each piece of content you create? Wise outsourcing can not only increase your efficiency and help level the playing field, but it allows you to focus on the core of your business–your writing. If you decide to outsource, determine what tasks you’ll pay someone else (editors, virtual assistants, designers, accountants, etc.) to handle. Kudos to you for making it this far! It may seem like a daunting task to compile your business plan, but I assure you it is well worth the effort. Plus, your plan can be developed over a period of time, and doesn’t have to be nailed down all in one sitting. A business plan is fluid and ever evolving. As new info comes in, circumstances change, or as results and analysis dictate, adjust your business plan accordingly. Remove sections from this plan that you feel don’t apply, and add sections that you feel are more relevant to your specific business needs. Review and re-examine your plan on a regular basis to help keep yourself–and your writing career–on track. And be sure to reward yourself when you’ve reached certain milestones and objectives. You’ll have most certainly earned it! Questions? Comments? Please share your thoughts below. Reading through your posts can be long and tedious, especially for people like me who always take notes. But in the end, it’s worth it. Thanks for another awesome post. That’s why I’ve included the workbook – all the info, without the need to write it all down yourself. This is just awesome .. Love it!! Thanks so much, Kimberley! This is super helpful and so timely — my community of Queens, NY, is conducting a business plan competition with nice prize money. Glad to have your insights and guidance in the final days of preparation. I was hoping to grab this fabulous download, but when I entered my email address and went through to the next page, the error message said the pdf could not be found. I thought this was because I was on mobile, but I tried several times on my PC and it still was appearing as not found. My apologies Kieran – there is a bit of a glitch with the media file. Shoot me a quick email (Kim-at-YourWriterPlatform.com) and I’ll send it to you directly.